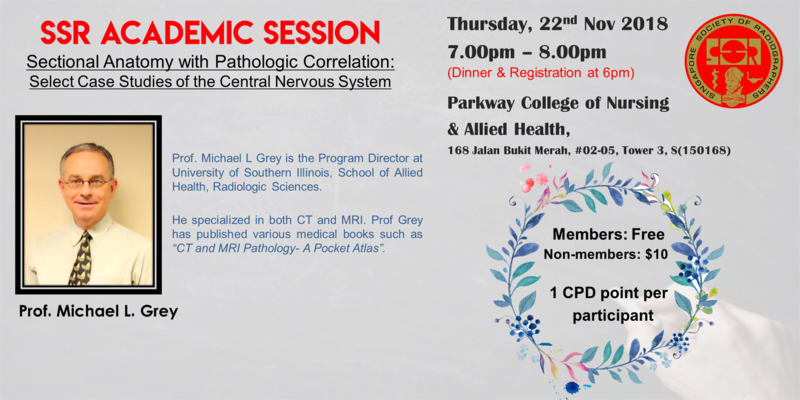 Singapore Society of Radiographers - SSR Academic Event: Sectional Anatomy with Pathologic Correlation - Case studies of the Central Nervous System google-site-verification=6eg37azjhvwaxcy2doqbopjwffmjhez5xkz5jupnypg23zq3m7la.mx-verification.google.com. Join us on the 22nd Nov 2018 for an academic session with Professor Michael L. Grey! Prof. Grey will be covering sectional anatomy with correlation to pathologies, along with selected case studies as well. Prof. Grey is the Program Director at University of Southern Illinois, School of Allied Health, Radiologic Sciences. He specializes in both CT and MRI with a plethora of experience under his belt. Prof. Grey is veteran speaker and advocate of education, having been teaching and presenting at conferences since 1987. Prof. Grey has published various medical books such as “CT and MRI Pathology- A Pocket Atlas” , as well " Imaging for the Health Care Practitioner". So come on down and have an educational evening with us! Members can register for free while non-members can register for $10. Dinner will be provided and will be Halal. Do leave a note if you are vegetarian. Venue is at Parkway College of Nursing & Allied Health, located at 168 Jalan Bukit Merah, #02-05, Tower 3, Singapore (150168).